In today’s economic climate, many companies are adopting subscription business models in response to market changes and increased customer preference. Shifting to a business subscription model can be challenging in many ways and innovative software solutions are integral to this shift. The latest research on subscription billing revenue in 2019 reveals significant growth for Independent Software Vendor (ISV) solutions for cloud-based Dynamics 365 ERPs. Offering recurring payment options to buyers requires plenty of effort behind the scenes on the part of issuers, acquirers, and merchants as well as ISVs involved. Zion Market Research has published a new report in 2019 on the subscription and billing management market with comprehensive analysis, and forecasts for 2018 to 2025. According to this report, the global subscription and billing management market was valued at $3.8 billion in 2018 and growing to $10.5 billion by 2025, at a rate of 15.5% between 2019 and 2025. Gartner, the world's leading research and advisory company predicts by 2020 over 80% of software providers will utilize subscription-based business models: “Subscriptions provide better entry-level pricing and the ability to add features as customers mature and gain value from the initial experience,” explains Laurie Wurster, research director at Gartner. The US subscription economy was estimated at a value of $420 billion in 2015. In 2015, revenue growth was 13% and in 2019, 22% which is 5 to 9 times faster than S&P 500 companies' revenues. One of the reasons for this strong recurring billing growth is the transition from product-centric to lifestyle or customer-centric solutions for both end-users and businesses, according to subscription billing consultancy Zuora. By migrating to a subscription business model, companies could generate greater consistent revenue, giving them a competitive advantage over rival firms still focused on one-time point-of-sale strategy. The more guaranteed revenue means the more valuable a business is going to be, as a high percentage of the revenue of a subscription-based business is recurring. Cloud computing is the delivery of on-demand computing services – from applications to storage and processing power – typically over the Internet and on a pay-as-you-go basis. Public cloud growth is another factor fueling subscription-billing growth. According to research firm IDC, the public cloud services market grew 28.6% in the first half of 2017, with revenues totaling $63.2 billion. All of this leads to a leap in demand for cloud billing solutions for complex billing schemes at global enterprises. The top cloud providers for 2019 have maintained their positions with upsells to Artificial Intelligence, Internet of Things and analytics for Amazon Web Services, Microsoft Azure, and Google Cloud Platform. (Zdnet) Amazon Web Services (AWS) is the leader of the market, while Microsoft’s Azure is in second place. Microsoft's cloud business could be bigger than Windows by 2021. (KeyBanc Capital Markets). Although Microsoft does not release revenue figures for Azure, in early 2019 it announced its growth rates. Microsoft’s aggressive shift from on-premise to cloud-based software sales began over two years ago, with huge amounts of investments into several areas of cutting-edge computing. Dynamics NAV 2018 was the last version of NAV and all future releases, whether on-premise or cloud-based versions will be known as Dynamics 365 Business Central. The Dynamics AX brand was officially retired in July 2017, and continues under the Dynamics 365 for Finance and Operations brand. Microsoft has achieved its dream of a unified business solutions platform with Dynamics 365 in which Customer Relationship Management (CRM) and Enterprise Resource Planning (ERP) functionalities exist in harmony to increase profitability of a business. Dynamics CRM organizes as well as automates and synchronizes sales, marketing and customer service, while Dynamics ERPs, including Dynamics 365 focuses on reducing costs and making business processes more efficient. As Microsoft continues to build on its success with Dynamics CRM and Dynamics 365 in 2019, one of the biggest challenges is the recurring billing model. 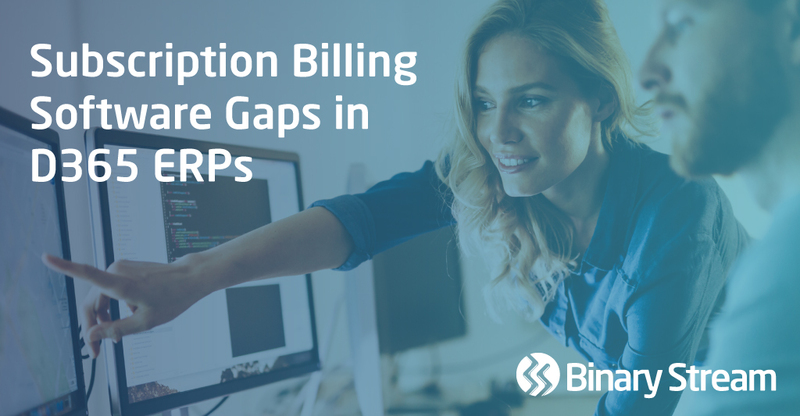 Although Microsoft Dynamics 365 Business Central and Microsoft Dynamics 365 for Finance and Operations provide core ERP functionality on the cloud, Independent Software Vendors’ (ISVs) solutions are required for a recurring billing gap. As businesses move towards the recurring billing model, there may be gaps with current installations of Microsoft Dynamics 365. Every business is different with unique needs and some of these gaps are specific to the industry, location or size. Dynamics 365 ISVs through the Microsoft ISV partner business can provide solutions to solve specific complex recurring billing for growing organizations. To manage the value of recurring customer relationships, excessive manual work to manage monthly invoicing will strain the organization. This leads to the risk of error prone manual data and compliance issues with the new GAAP and IFRS standards. As businesses are growing with subscription billing complexity, they could also be losing potential revenue due to missed billing. Dynamics 365 subscription billing ISV solutions can solve that gap: normal invoicing cycles can take days and involve complicated spreadsheets and error prone manual processes. Regardless of billing frequencies or pricing methods, subscription billing ISV solutions cover the entire quote-to-cash process by working efficiently in the background and generating thousands of invoices while saving valuable time and resources. As Microsoft Dynamics has shifted from on-premise to cloud-based solutions, Dynamics ISVs have also recognized this shift by developing and releasing subscription-billing products for Microsoft’s cloud-based ERP systems – Dynamics 365 Business Central and Dynamics 365 for Finance and Operations. One example is Binary Stream’s Subscription Billing Suite (SBS) that provides insightful financial data and is GAAP compliant. By reducing the invoicing cycle from days to hours, it can streamline an entire accounting system. In addition, it can easily extend to cover the entire quote-to-cash process. Binary Stream’s Subscription Billing Suite (SBS) ISV solution streamlines complex billings for Microsoft Dynamics ERPs, including Dynamics 365 Business Central and Dynamics 365 for Finance and Operations. Binary Stream’s Subscription Billing Suite enables you to meet complex billing scenarios, and grow your business through improved decision-making based on accurate revenue data. Watch Subscription Billing Suite Product Tours to Learn More.